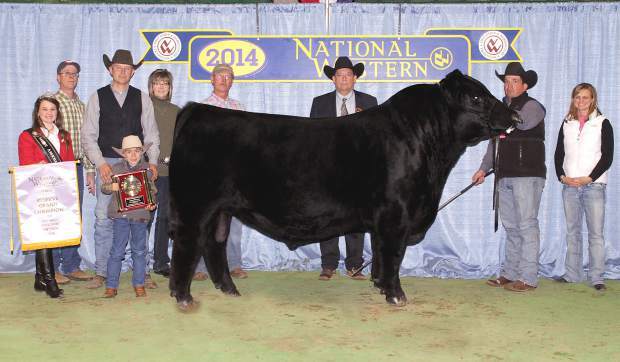 BSF Opportunist Z5 won reserve grand champion bull at the 2014 National Western Stock Show Super Point Roll of Victory (ROV) Angus Show, Jan. 15-17 in Denver, Colo. Broken Arrow Angus Ranch, Fallon, Nev.; Hoffman Ranch, Thedford, Neb. ; and Jake Bloomberg, Berwick, Ill., own the February 2012 son of BSAR Opportunity 9114. He earlier won reserve junior champion. Jarold Callahan, Yukon, Okla., evaluated the 285 entries. Photo by Carrie Heitman, American Angus Association. Angus exhibitors led 285 entries at the 2014 National Western Stock Show Super Point Roll of Victory (ROV) Angus Show, Jan. 15-17 in Denver, Colo. Jarold Callahan, Yukon, Okla., evaluated the entries before naming champions. Exhibitor: Styles Angus Inc., Brentford, S.D. Exhibitor: Reid Angus Ranch, Akron, Colo.
Exhibitor: Reagan Skow, Palisade, Neb.